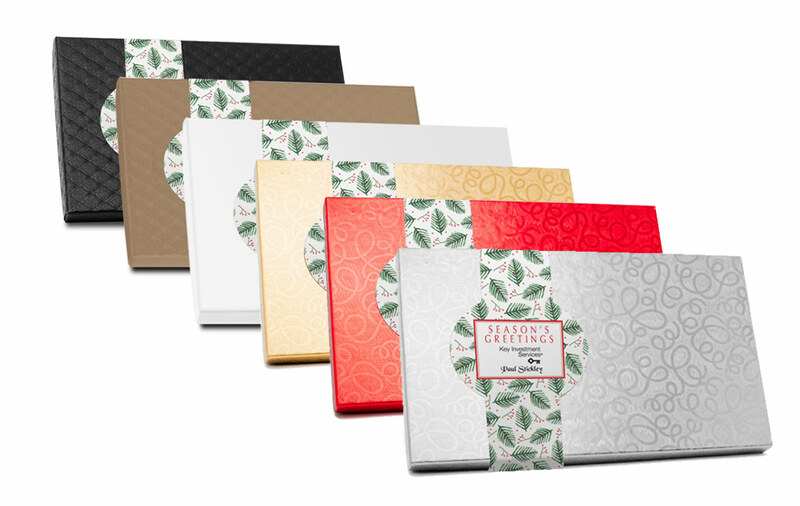 These large 8oz chocolate bars make for an impressive and memorable corporate gift. Your design and logo are precision-engraved into the ~8.5" x 5.5" chocolate bars. You can choose from existing stock designs and incorporate your logo or submit a completely custom design of your own. 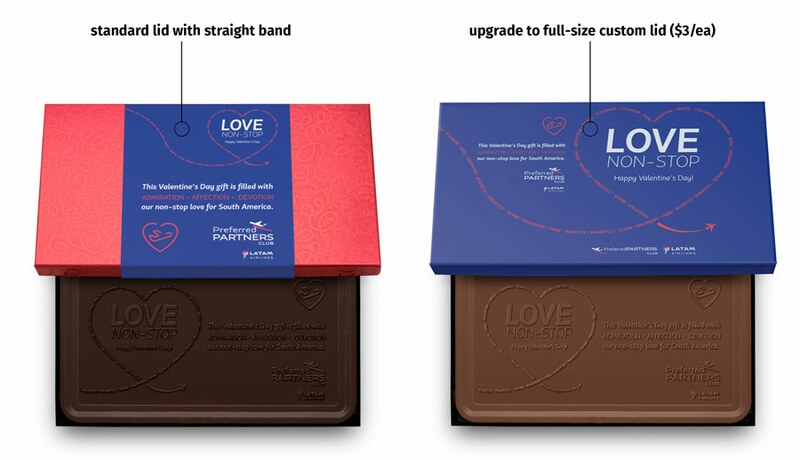 The bars are packaged in elegant boxes with personalized bands around the lid. You can also upgrade the packaging to a completely custom-printed lid with your artwork. These giant 1/2lb chocolate bars are available in your choice of Belgian milk chocolate, dark chocolate, or a combination of both. Belgian chocolate is considered by many to be the gourmet standard by which all other chocolate confections are measured. Both chocolate flavors convince with a distinctive and well-rounded flavor profile which is not overly sweet but rich in taste. A complex custom molding process allows you to add your logo and design to the face of the chocolate bars. The precision-engraving process ensures very detailed curves and lines. Your recipients will be amazed with these large & delicious piece of art! Included in the price is also a full-color band, personalized with your logo, message, and design. This card stock band offers additional space for your branding and design and wraps neatly around the packaging. Looking for even more imprint space? 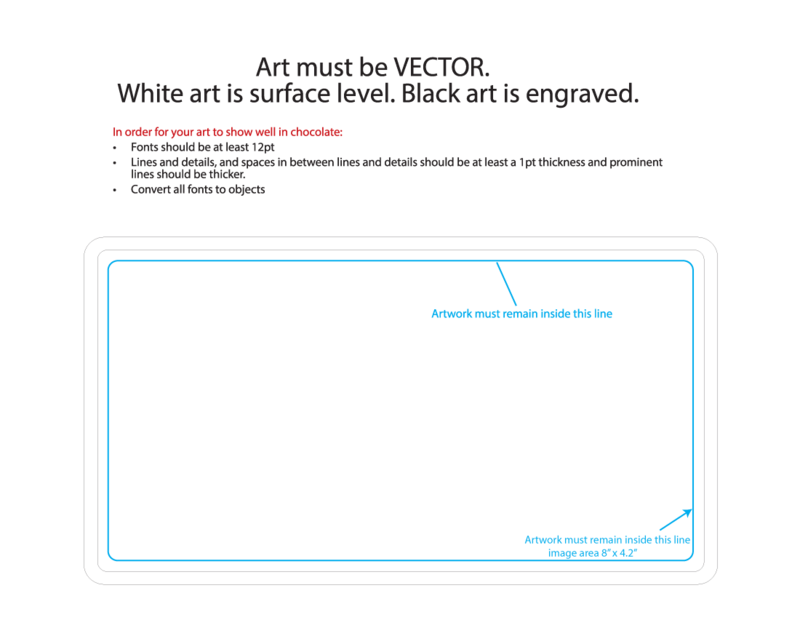 For an up-charge of $3 per item, you can get the entire lid printed with your full-color artwork for the maximum impact on your recipients and even more space for your branding. - Yes, you can upgrade to a solid full-color lid with your artwork and greeting printed on the entire lid. This gives you extra space for your message and branding. This upgrade is available for +$3 per bar.